A pair of cast silver buckle loops, found in close association with each other, dating to the late 5th -6th centuries. Both buckles are D-shaped with a narrowed offset bar for the tongues, now missing. The faces of each buckle are heavily finished and bevelled, leaving them faceted on their outer edges and smooth on the inner surfaces. The smaller of the two buckles (b) is smoother and faceting less obvious than buckle (a). Some iron corrosion is present on both buckles' strap bars, likely due to the attachment of the now missing buckle tongues, a common feature of such buckles. Turquoise copper corrosion is in patches across much of the both buckle's surfaces, probably indicating highly debased silver. Where not stained by corrosion the buckles are a dark silvery-grey colour. 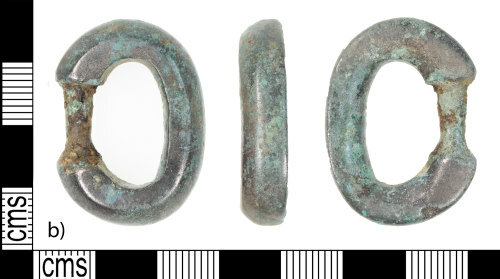 These buckles fits Marzinzik's (2003) Type I.2 and Hines and Bayliss (2013) Type BU2-d, which both date them broadly to the mid fifth to sixth centuries. The type is fairly common across early medieval northern Europe and is particularly well-represented in female Kentish burials (Marzinzik 2003, 21; Hines and Bayliss 2013, 138, 332, Table 6.13). As the buckles are made of silver and are over 300 years old, they constitute potential Treasure under the stipulations of The Treasure Act 1996.